Com umlocal e hora será previamente estabelecida, voçê será convidado aparticipar no lançamento do balão. Tal como num avião, o piloto lhe explicará os procedimentos de segurança antes de levantar voo. Depois de insuflar a aeronave e voçê estiver a bordo ... a sua aventura aerea começa. We meet at your allocated launch site at the agreed meeting time where passengers are invited to participate in the launch. Just as if you were flying in an aircraft the pilot will explain all the safety procedures before take off. 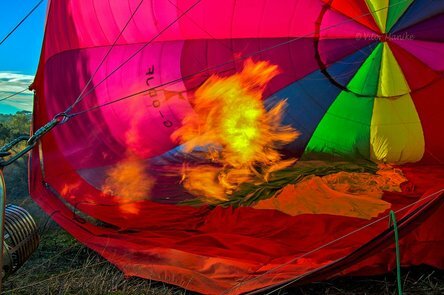 Once the balloon is heated, inflated and you´re in… your flight adventure starts.